You may be among the first 30 million people – alive right now – who’ll live to be 150… and enjoy it. But there’s one thing I know for certain… over the next three years, the Life Extension industry could reward active investors with some of the century’s most fantastic gains! Because even if you only end up living to 85- or 90-years old, today you could position yourself for a string of large stock-market successes on at least 11 trailblazing companies that look set to dominate the Life Extension sector. Five that have treatments and potential cures that seemed like science fiction five years ago, but are in FDA trials now. Three that look to be getting closer to successful Alzheimer’s treatments… one of the companies may have stopped Alzheimer’s progress cold in a recent FDA trial. Another three that are on the leading edge of cancer cures… the kind that cured President Jimmy Carter’s brain cancer when he was 91-years old. And, there is one well-known biopharma company that thinks it may have discovered a way to stop human cells from aging so quickly. It could be the true gateway to living to 150. Today we know that what was once only scientific theory is now becoming reality. We’re on the cusp of what could be permanent cures for most cancers, Alzheimer’s, diabetes, and heart disease. These cures are the gateway to the Holy Grail of all human dreams – they have the ability to double average lifespans to at least 150 years, possibly well beyond that. As you’ll see, new research has proved living to 150 could be an easily viable reality within the next decade. In a series of special reports I have added and updated in my Wealth Library, I’ve gone onto depth on the exact details of how researchers are finding miraculous ways to turn off the human body’s aging mechanism… even reverse the aging process. These are brand new and refined discoveries that are part of the new wave of pioneering biotech innovation. Each has a profit potential that is nothing less than extraordinary … 400%, 700%, 1,000% … even 20,000% opportunities that are on the table right now. To show you what’s at stake for you in biotech investing today, consider a story first reported by the MIT Technology Review . A battle over who owned what’s been called the biggest biotech breakthrough of the century pit a team of researchers from Harvard and MIT against two Silicon Valley biologists to decide who owns the patents for CRISPR, a breakthrough form of DNA editing. In what would once have seemed like pure science fiction, CRISPR lets scientists easily edit or disable genes. CRISPR is a powerful and relatively new gene-editing system that has revolutionized scientists’ ability to make precise changes in DNA. It has been used in labs to correct the mutation that causes sickle cell disease, create mosquitoes that can fight malaria in their bodies, and make crops more resistant to disease and drought. CRISPR has also rid mice of muscular dystrophy, cured them of a rare liver disease, made human cells immune to HIV, and genetically modified monkeys. The applications may be limitless, so control of CRISPR’s underlying technology could be worth tens of billions of dollars. The two Silicon Valley scientists who first harnessed the powerful gene-editing technology lost their long-running quest to solely control the rights to their invention. An appeal board said an MIT team’s use of CRISPR was okay, too… now there are three publicly traded CRISPR companies. But brand new data suggests that only one of the three will be the huge winner… this is the pioneering CRISPR company with a potential upside as high as 788%. So, you don’t want to bet on the wrong horse in the CRISPR race, there’s too much at risk. That’s why I want you to have a FREE copy of a new special report I’ve just written… CRISPR — Three Companies With Pioneering Gene-Editing Treatments. But CRISPR is but one of the miraculous biotechnology trends today. There are some other powerful moves you can make in biotech now – and they’re ones that could deliver fortune-building gains to even moderately aggressive investors. The astonishing rate at which new cures and therapies are being discovered means the biotech industry has begun to generate significant profits for investors large and small. There are two ways for you to play this new flood of breakthroughs. The easiest way to access the new biotech mega trend is with a super low-risk approach. In it, you buy into a biotech ETF, such as the SPDR S&P Biotech. It’s a temperature gauge on the heat coming from the biotech industry. Since Feb. 2016, just over two years, as the SPDR S&P Biotech ETF has soared 112% ... It’s up 20% since April. In other words, it’s an ETF that’s being driven much higher by red hot biotech stocks. I am not going to mislead you; the ETF is a smart, generally lower-risk biotech play. But by accepting more risk, you could put the ETF’s steady profits in your rearview mirror and rapidly build real, sustained, and lasting wealth. You could do it by focusing on a handful of fast-breaking investment opportunities that are now charging out of the Life Extension industry’s gate. If being more aggressive is your path, even with a small portion of your portfolio, then you need to know about these companies ASAP. In short – by jumping onto the Life150 fast track, investors blessed with vision are going to become incredibly wealthy by riding the explosive growth trend in the Life Extension industry. What I’m about to reveal to you has never before been assembled in one place. I am prepared to pull back the curtain and take you on a virtual walk down the halls of the some of the world’s most hush-hush biotech laboratories. You’ll have the chance to go behind the scenes to a world of revolutionary biotech advancements, where usually only the ultra-rich venture capitalists roam. But you won’t need a checkbook backed by hundreds of millions of dollars. America’s best days are ahead. And that means there has never been a more historic time to invest in trailblazing biotech breakthroughs than today. In just over 100 years, mankind managed to nearly double its life expectancy. That doubling happened without the aid of supercomputers, or the map of the human genome, or billions of dollars in private investments. Heart disease survival numbers are just as stunning... perhaps even more so. These skyrocketing survival rates are but the first indications of how close we are to grasping lifespans that double to 150 years. It’s a mega trend I call Life150. This trend is as great or greater than other massive life-altering events in history… harnessing fire and electricity; penicillin; the internal combustion engine; man on the moon; the computer… and may all pale in comparison. New high-tech drugs that are permanent cures for cancer, Alzheimer’s disease, diabetes, and childhood diarrhea. Envelope-pushing scientists who are now actively testing methods that rejuvenate old muscles and aging brains using techniques that are nothing short of mind bending. A DNA editing tool, known as CRISPR/Cas9 that could provide an easy means for molding a person when he or she is just a single-celled embryo. That includes altering the aging gene. Near miraculous biomedical advances that use biocompatible materials and cells with 3D printers to create complex functional living tissues and whole organs suitable for transplant. An alternative use for a current drug that when mixed with a common compound has delivered a stunning result – a single dose reversed aging in lab animals. The power-packed potential profits from the Life150 mega-trend is off the charts. Mere hints about young companies with inside tracks on new cures and therapies have created sizzling stock returns. Whispers about the already massive paydays on early-stage biotechs – between 500% and 2,000% – are more than rumors and idle boasts. But there are even bigger breakthroughs in the pipeline right now. And I intend to point you in the exact direction that allows you to maximize the Life150 mega trend’s awesome potential! It may have had only 20 full-time employees, Advaxis jumped 600% – from $4 in November 2014 to $28 in June 2015 – after it announced two new drug applications and two very promising sets of trials. Then there was Recro Pharma. With only five full-time employees, it soared from $3.30 at the beginning of March 2015 to $12 by late May 2018 on news of Phase III trials. As you can see, I am not talking about making huge returns on high-risk penny stocks and speculations. Radius Health (RDUS) – listed at $8 in June 2014, its shares jumped to $65 in June 2015. Its new drug let RDUS investors score a 713% gain in one year. Receptos (RCPT) – its shares were at $26 in May 2014. Positive drugs trials on multiple drugs pushed shares to $189 in June 2015, rewarding investors with a 627% return in 13 months. OPKO Health (OPK) – was formed by a reverse merger in February 2007 and opened at $1.98 a share, by 2015 OPKO was at $16.80, a 748% gain. Halozyme Therapeutics (HALO) began trading on March 2, 2014, at $7.46. It’s now at $19.5, which is a 161% gain. Assembly Biosciences (ASMB) announced its reverse merger on July 11, 2014 at $7.25; by June 2018, its shares were sitting at $47.62 for a 556% gain. Again, an average return of more than 100% a year. You get the picture… and I forecast that these past three years are just the opening barrage of huge profits that will spring from an industry that can barely keep up with its own rapidly evolving innovations. Remember, the lower-risk was to play biotechs, and ETF is up 112%, so the action is steady and rewarding. In a moment, I am going to show you pioneering science that looks set to cure Alzheimer’s, cancer, diabetes, and the grand slam home run of them all, aging! But first, I want to introduce myself so you’ll see and understand that I am usually way out in front of mega trends. My name is James DiGeorgia, and I’ve been in the financial investment industry for over 35 years. In fact, I started my first coin business when I was still a junior in high school and made my first million before I was 21. I’ve been a featured guest on CNBC, Fox Business, and am frequently quoted as an expert in The New York Times , USA Today , Los Angeles Times , Money magazine, The Chicago Tribune , and Barron's , to name just a few. I’m also the author of several best-selling books including The New Bull Market in Gold , The Rise of Gold in the 21st Century , The Global War for Oil , and The Trader’s Great Gold Rush . And not to brag, but when President Trump’s good friend, and Mar-a-Logo member Christopher Ruddy found his publications in a rut, he brought me into the inner circle to energize them. Today, as has been the case for most of the past 30 years, I run a successful publishing business. I’m currently the Publisher and Editor for the most profitable investment advisory services in the world... Gold and Energy Advisor , Superstock Investor , Wall Street Rebel , Gold and Energy Options Trader , and World Opportunity Investor , which is my newest publication. Take a look at my track record – only a handful of people in the world can lay claim to these kinds of returns. Gold and Energy Advisor up 210% in the last 10 years – averaging a solid 20% a year. Gold and Energy Options Trader has delivered an average of 584% year for the last 8 years running! That adds up to 4,677% in profitable recommendations. SuperStock Investor Morning Matters portfolio is up 504% in the last 7 years. That's an average cumulative gain of 72.57% a year! As I said… only a few people in the world can deliver gains like the ones I just shared with you. And mind you, these are independently audited results – profits you can take to the bank. But there are more opportunities to come. I made a fortune at a young age, before I turned 21, and that allows me the freedom to be up front about the financial insights I’ll share with you. As noted, my latest publication is called World Opportunity Investor . It’s a financial newsletter for people who want to be some of the first into breaking trends with unlimited upsides. But the “crises” to which World Opportunity Investor refers are not the trumped up doom and gloom events that the financial world seems so addicted to predicting these days. I don’t believe America is about to be flushed into some dystopian hell. I hope you don’t either. No, the critical-opportunity trades we’ll show you are fast-track opportunities across the markets. Depending on the urgency, these opportunities will range from biotech breakthroughs, to natural resources, to high-technology, as well as to sectors such as transportation, banking, healthcare, cyber security, and homeland defense. Again, we don’t focus on imaginary crises. World Opportunity Investor puts you out front of solutions to real-world problems… ones you can invest in early… ones that could make you significant gains time and time again. And, as history has proved… I am famous for getting an early jump on huge trends. In 2003, I wrote a bestselling book, The New Bull Market in Gold . I probably should have called it The New Bull Market in Bold , because while everyone was obsessed with tech stocks, I was predicting $1,000 gold prices by 2008. Back then, everyone thought I was crazy. After all, gold was at $400. Then, my prediction came true. Gold blew way past the $1,000 price-point. In 2004, when oil was sitting at $32, I wrote The Global War for Oil . Once again, everyone thought I was nuts for predicting $100 oil. You know how that turned out… a skyrocket with my name on it. Now, the economy is healing. The dollar is strong and that means exports are down. This is when America historically looks inward to homegrown industry. I am so convinced that my team can deliver win after win after win after gigantic biotech win... that I have arranged for you to try World Opportunity Investor absolutely Risk-Free. As someone in the markets, you’ll have to admit there’s not much better in the financial world than Risk-Free. I am offering you zero-risk because as an investor, you have two choices today. You can believe the so-called pundits who’ve spent two decades wringing their hands and predicating a financial apocalypse that never occurs. Or you can embrace the fact that the U.S. markets are the greatest wealth creation machines in modern times. Yes, the markets aren’t democracy… but ultimately, everyone gets a fair shot at wealth, hedge fund traders and Main Street investors alike. Every month, the pages of World Opportunity Investor will put you in the heart of real action and place you directly on the leading edge of specific sectors. Tomorrow… don’t worry about tomorrow; we’re already on top of that, too. That’s why when you agree to try World Opportunity Investor , you’ll gain the access that allows you to begin each day with a quick podcast or video briefing on coming market action, daily trends… and trailblazing investment opportunities. Right now, we are deep into examining how new miracle drugs and treatments can ease or erase suffering and pain. And how true cutting edge compounds can open the door for you to live to 150 or beyond. These are pioneering breakthroughs that are coming to the market at a jaw-dropping pace with no end in sight. Why You Must Make Your Move Now! The best news is the hottest new disease treatments are still in the pipeline, so there is still time to position yourself for the wealth they will generate. Moreover, you could be one of the very first to learn the name of the publicly traded company – and its exact drug compound – that could help you live to 150! Let’s look at disease cures first… then I’ll show you how to be one of the first to read what could be the most important financial report ever written: THE HOLY GRAIL OF AGING -- Live To 150 And Grow Filthy Rich Along The Way. Keep reading and I’ll tell you how to get your FREE copy in a few moments. The potential for soaring profits from companies with cancer cures is off the charts. This is a vital key to living to 150, because the longer you live, the chances are you’ll need occasional access to advanced medicines. In other words, the chances could be strong that you will easily survive the cancer that was a death sentence for past generations. Of all the great biotech researchers in this field, one company could have the inside track. In fact, its profits could be staggering. The national cost of cancer care is expected to skyrocket because as the massive Baby Boomer generation grows older, more and more of them will likely develop cancer. Moreover, cancer's economic impact is greater than any other cause of death worldwide, according to a study carried out by The American Cancer Society. The study revealed that cancer costs the world economy nearly $3 trillion every year. That’s why cancer immunotherapy could quickly become a $15 billion industry. And one small company could dominate because it believes it can use immunotherapy to Super Charge Immune Cells To Kill Cancer. Immunotherapy is one of the most exciting fields of research in oncology. Successful drug development in this space offers a highly lucrative opportunity– such as the one I’ll point out to you. You’re going to want to make a move into three companies soon, because their researchers are leading a drug development frenzy that is driving rapid expansion of the pipeline across an array of cancer cures. I am expecting huge price spikes because these companies look set to launch exciting and novel cancer immunotherapies including vaccines in the not so distance future. Immunotherapy is forecast to claim a staggering 91% share of the cancer market by 2023… just eight years from now. But you could expect the trailblazing breakthroughs to be priced into these shares as early as six months from now. That’s why it’s vital that you make your move now, because I am calling for one company’s stock to jump by as much as 358%. Then it could be swallowed by a major biotech such as Novartis. And if that happens, your total gains could soar as high as 989% or more. You’ll get the whole story – completely laid out for you, including the names (and stock symbols) of the companies to buy now – in my hot-off-the presses Special Report – SERIAL KILLERS: 3 Companies on the Verge of Curing Cancer That Could Be Commercialized in the Next 48 Months. It’s yours as a FREE bonus when you subscribe to World Opportunity Investor . This year, the direct costs to American society of caring for those with Alzheimer's will total an estimated $226 billion, with half of the costs borne by Medicare. By 2050, Alzheimer's is projected to cost over $1.1 trillion. But an Alzheimer's disease “cure” would create an even bigger market. The returns on one small company’s stock could be staggering for people who discover it now. Is Brain Fog Just Gunk between the Nerves? We’ve known for 30 years that a gene causes Alzheimer’s. And a few years ago, scientists finally succeeded in removing some protein fragments (amyloids) from an Alzheimer inflicted brain. These fragments are what cause tangles and inflammation to form between nerve cells (neurons) and kill them. Sadly, these people did not get better. Then big news came from a study in Australia. Researchers discovered the protein fragments accumulate in the brain 15 years before Alzheimer’s symptoms strike. So all the early drug trials failed for the same reason that people with congestive heart failure or who’ve had heart attacks don’t get better taking cholesterol lowering drugs. The treatment is years too late. Now, let’s skip forward to the breakthrough science. Because of the Australian study, treatment for patients now begins very early on in the disease. So the idea is to turn off the spigot before the drain gets unclogged. A conservative strategy in biotech investing is to focus on companies that are committed to raising dividends. One company that has invested billions in Alzheimer’s research raised its quarterly dividend by $0.52 a share… or 2%. When you combine a company in this sector that’s ratcheting up both its dividend payouts and developing new multi-billion dollar drugs, you put yourself in position to rack up substantial gains. The key then becomes timing your entry into the stock. The time is now with this large biotech. I lay out its exact details in another FREE report I’d like you to have the moment you subscribe to my World Opportunity Investor . The FREE report is called UNCLOGGING THE BRAIN – 3 Companies Heading Towards Alzheimer’s Cure . You’ll gain immediate access to it the moment you accept my fully guaranteed, no-risk offer to join the growing family of World Opportunity Investor readers. Here is a science-fiction thought that is no longer implausible. Someday soon, when people are 40 years old, they may routinely get their brains scanned. If amyloid looks like it’s too high for their age, they could start taking a drug that brings their amyloid back down. In other words, they’d take a pill in the same way people manage cholesterol and high blood pressure. If the drugs from this one small company are successful and safe, they could become for Alzheimer’s what statins are for cholesterol. Moreover, as I write, another biotech had a tremendous potential breakthrough with an Alzheimer’s treatment. Quite simply, it improved cognition and slowed the disease. Of course, its stock jumped on the news, but this story is just unfolding. It has legs because the current $259 billion cost of Alzheimer’s care in the U.S. will reach an unsupportable $1 trillion annually by 2050, according to the Alzheimer’s Association. This could be one of the most important reports you ever read … ever! It’s called UNCLOGGING THE BRAIN – 3 Companies Heading Towards Alzheimer’s Cure . This Special Report is yours absolutely FREE when you try World Opportunity Investor for no risk on your part. The FREE report lays out the name of the biotech company that may have stopped Alzheimer’s in its tracks. Understand, this is not a cure, like statins are a cure for high cholesterol. It is a treatment that could stymie Alzheimer’s at its earliest stage. This is a company you need to own now in order to position yourself for potentially skyrocketing profits. And you’ll only find it in UNCLOGGING THE BRAIN – 3 Companies Heading Towards Alzheimer’s Cure . When you accept my Risk-Free invitation to subscribe to World Opportunity Investor , you’ll also gain immediate access to another cutting-edge Special Report absolutely FREE. This one outlines some of the more far out Sci-Fi biotech opportunities that are gaining momentum right now. It’s called Science Fiction Discoveries That Could Make You Rich . Here’s a taste of what you’ll find inside it. You’ll be introduced to the small company that shocked the medical community when it announced it made the first 3-D printed (bioprinted) liver tissue. Such a discovery, from a NASDAQ-listed company, has the potential to revolutionize medical research and create massive rewards for investors. Currently, the company’s 3D bioprint tissues are used for research. By making live human liver tissue commercially available, researchers are now able to test the effectiveness and toxicity of medication prior to clinical trials without the possibility of damaging the liver of subjects. Will it be the Pep Boys of Organs? Right now, the company is also printing simple items such as blood vessels for bypass grafting, nerve grafts for nerve damage repair, and functional tissue patches for the repair or replacement of damaged tissues and organs. How long will it be until demand from the world’s rapidly expanding transplant-candidate lists will push the company into the spare parts business? The 3D bioprint company is just one of 5 that you’ll meet in Science Fiction Discoveries That Could Make You Rich . It’s yours FREE and yours to keep forever when you accept my Risk-Free invitation to try World Opportunity Investor . This is the Special Report that, on so many levels, is the one that completely justifies the price I’m asking for a Risk-Free subscription to World Opportunity Investor . I have spent a small fortune starting up this newsletter... researching your shot at living to 150… your potential to grow hugely wealthy on specific plays in the Life Extension industry. Because I have such a clear vision of who will thrive by accepting a $72-a-year Risk-Free Trial subscription to World Opportunity Investor , I am confident about making this 100% money-back guarantee to you. And I also have a surprise offer for you… perhaps one the best financial advisory offers ever. You’ll see it in a bit. It comes with my iron-clad guarantee, too. That guarantee is this: if there is any reason you are unsatisfied with World Opportunity Investor during the first 90 days of your subscription, I will promptly refund 100% of your money. And anytime after that, I will refund the prorated balance of your subscription. Not gladly, but promptly and with no questions asked, restocking fees, or exit interviews. On top of that, ALL the Special Reports are yours to keep FREE regardless of what you decide. As you’ve seen, the biotech breakthroughs that cure diseases are nothing short of eye popping. They are going to be important to a long, healthy life, because until you get your DNA edited, the chances are you might get sick along the way to 150. But living to 150 will involve more than curing diseases. In this most important Special Report, you’ll discover why LIFE150 will involve curing the human aging process at an essential level. It’s going to be more than highly specialized cells that help spur the self healing of the heart, lungs, and nerves. It’s going to eclipse organ transplants. The Shocking Laboratory Results that Could Change Everything and Make You a Fortune! That’s because regenerative medicine has a side to it that is, quite frankly, science fiction on steroids… and it’s coming to life right now. In March of 2015, a research team from The Scripps Research Institute, Mayo Clinic, and other institutions made a huge breakthrough on the Life150 front. Researchers identified a new class of drugs that in animal models, dramatically slows the aging process—alleviating symptoms of frailty, while improving cardiac function and extending a healthy lifespan. The scientists coined the term “senolytics” for the new class of drugs. “The prototypes of these senolytic agents have more than proven their ability to alleviate multiple characteristics associated with aging,” said Mayo Clinic Professor James Kirkland, MD, PhD, senior author of the new study. The class of drugs targets the body’s senescent cells. These are cells that have stopped dividing. They accumulate with age and accelerate the aging process. These cells clog up the system and interfere with healthy functioning. But how do you target bad cells and leave the good ones alone? Which compounds do the trick? The answer to that could make you a fortune. Actually, one of the compounds is currently available over the counter. It’s well tested and considered safe. But chances are, you’ll only discover the amazing power of senolytic agents – and which public company makes the primary drug – by subscribing to World Opportunity Investor today. I am not kidding about this being the Holy Grail of aging. Because after a single course of treatment… one dose in animal testing… the compounds improved cardiovascular function and exercise endurance, they reduced osteoporosis and frailty, and extended health spans. Best of all, the effect lasted for at least seven months following a single treatment with the drugs. That means side effects could be minimal at best because of the infrequent dosing. The company that makes the LIFE150 compound is no fly-by-night operation. It has a number of other cutting-edge drugs in its pipeline and a stock that is now in significant growth mode. You need to get in on this now because you know darn well that once my Special Report, THE HOLY GRAIL OF AGING: Live to 150 and Grow Filthy Rich Along the Way has been public for a while, the cat will be completely out of the bag… everyone will be talking about it. Because of that, everyone else will want to get in on The Senolytics Movement and your exclusive window for potential 1,700% to 22,000% soaring gains, will have passed. When you do, you’ll gain immediate access to what could be the greatest financial industry report ever written… THE HOLY GRAIL OF AGING – Live to 150 and Grow Stinking Rich Along the Way . So that’s it… the secret to living to 150… and making what could be a fortune… is at the heart of your subscription to World Opportunity Investor . It will be, without the slightest doubt, the best $72 you have ever spent on a financial publication. 12 ISSUES – one year of 12 monthly newsletter issues in which we lay out fast-breaking, trend-heavy opportunities for you. CLEAR INSTRUCTIONS WHEN TO SELL – When it comes time to exit a position or take some profits off the table, you will receive a comprehensive update with the logic behind the sell order. PROMPT, FRIENDLY CUSTOMER SERVICE – World Opportunity Investor has the gold standard for financial publishing subscriber services. THE WOI WEALTH LIBRARY and ARCHIVE – feel free to explore every trade WOI has ever made (there’s good stuff there) with your 24/7 access to the private, secure, members-only World Opportunity Investor website. That’s where you also gain immediate access to the entire library of wealth-building reports, the weekly updates, special reports, and tutorials. In other words, if you ever miss something or want to look back at the archives, everything there for you. CRISPR — Three Companies With Pioneering Gene-Editing Treatments: CRISPR is a powerful and relatively new gene-editing system that has revolutionized scientists’ ability to make precise changes in DNA. But brand new data suggests that only one of the three companies with the breakthrough will be the huge winner … this is the pioneering CRISPR company with a potential upside as high as 788%. You want to be in now, but you don’t want to bet on the wrong horse in the CRISPR race; there’s too much at risk. SERIAL KILLERS – 3 Companies on the Verge of Curing Cancer That Could Be Commercialized in the Next 48 Months: Expect their trailblazing breakthroughs to be priced into its stock share price as early as six months from now. Then, one could be swallowed by a major biotech, such as Novartis. And if that happens, your total gains could soar as high as 989%. UNCLOGGING THE BRAIN – 3 Companies Heading Towards Alzheimer’s Cure: Together the three have the potential to deliver you gains that could soar past 2,200%! SCIENCE FICTION DISCOVERIES That Could Make You Rich: All five companies in this report could be poised to soar between 134% and 271% on just a slight hint of positive news. THE HOLY GRAIL OF AGING – Live to 150 and Grow Stinking Rich Along the Way: Discover the amazing power of senolytic agents. Act now or you could miss the exclusive window for potential gains that could soar 201% just for openers. These 4 Special Reports are not available online or in any store. You won’t find them on Amazon. The only place you’ll be able to learn the names of these companies and position yourself for potentially untold profits is by subscribing to World Opportunity Investor Risk-Free. And, of course, you have my 100% Money-Back, No-Fuss Guarantee that World Opportunity Investor will become a vital part of your financial life. And remember if there is any reason you are unsatisfied with World Opportunity Investor during the first 90 days of your subscription, I will promptly refund 100% of your money. And anytime after that, I will refund the prorated balance of your subscription. Not gladly, but promptly and with no restocking fees, questions asked, or exit interviews. These 5 free reports will get you started. But soon after, you'll begin receiving our monthly publication - filled with multiple ways to profit in the months ahead. We'll also send you both daily and weekly updates on all our positions… news in the industry… and any special information you need to know, such as when a buyout might be coming, or a big investor is buying a lot of shares. All told, we'll be there to help you through any event that hits the markets. Everything is detailed in the Welcome Kit you’ll receive upon signing up for a one-year trial subscription to World Opportunity Investor . The cost to subscribe to World Opportunity Investor is generally $199 for the year… less than you’d pay for a year’s worth of Netflix. If you sign up now, you'll receive a special discounted trial-subscription rate – 12 months of our best research and recommendations for just $72 total. Considering the biotechs you’ll learn about might jump five to 10 times in value, I'd say that's as good a deal as you would ever see. So here's what I suggest you do… accept my invitation today… completely at my risk. Here's what that means… it means I’ll immediately send you each of the promised reports. Take the time to look over my research and see if the opportunities are as good as I say they are. I recommend reading through the latest issue of World Opportunity Investor so you’ll know what to expect. Track our portfolio… follow the recommendations (on paper or in real time). And if you decide it’s not for you – for any reason whatsoever – just email or call us within 90 days and receive a full refund. Of course, you can keep all the reports and everything else in the Welcome Kit free of charge. Consider it a free gift from me just for giving me a chance to prove my abilities to you. All you have to do to get started is call us at 1-800-718-8923 or fill out the brief online order form. Thank you and I look forward to hearing from you after you make a bundle on some of the world's best biotech plays. P.S. I finished a new Special Report just before I sent this letter. It has to do with the why investors must quickly explore the potentially huge benefits of making moves into a sensational emerging company in the ultra-legal cannabis sector. In the report 2018's Pot Stock Surprise Could Make You A Fortune , I identify a young company that’s already revenue positive and profitable by using legal, imported hemp, to make fully legal cannabis-based treatments for a host of human conditions. This is an opportunity you do not want to miss out on because it could multiply your money as much as 50 times. I’ll send this report to you, along with the four biotechs I promised you the moment you accept my deeply discounted, fully guaranteed, trial-offer of $72 for a year of World Opportunity Investor . Here’s A Great One-Year Offer! P.P.S. I made my first million as a teenager by trading rare coins. The love for coins has never left me. I want to share that love with you with a special one-year subscription offer. Accept a fully guaranteed, trial-offer of $72 for one year of World Opportunity Investor , and I will send you a 1921 Morgan Silver Dollar. The legendary coin is worth $49. The storied coin has a rich history. Between 1878 and 1904 more than 270 million were minted. Then in 1921, Congress ordered all those coins melted in order to make one-year of new Morgans… the 1921. Now, approaching 100-years old, the coin is revered by collectors. I will personally mail the 1921 Morgan to you almost the moment you subscribe to World Opportunity Investor for one year. And, to be straight up with you, should you decide to take me up on my no risk guarantee any time during your one year, unlike with the five special reports you get to keep, I’ll ask that you return the coin to me… or you can have the $49 value of the coin deducted from the balance of your subscription refund. I believe this is a truly fair offer. 1 year (12 monthly issues) for just $72 – 54% off the regular subscription price. 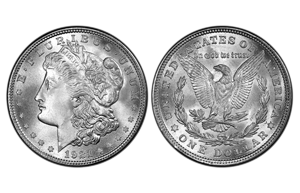 You’ll also receive a 1921 Morgan Silver Dollar by mail – worth $49! 6 months (6 monthly issues) for just $49. x West E, Regerative medicine: The need for a national strategy.Pharmaceutical Technology 2011; 35(7):133, 134. ©2019 Gold and Energy Options Trader, L.L.C. All Rights Reserved.